Coming across in the network to the another one post that Tenacious D has allegedly unfairly received a Grammy for best metal performance, Noizr's journalists decided to write a short article why "Golden Gramophone" should not be the measure of success for metal bands. Grammy is an American award, established by the Recording Industry Association of the USA in 1958. Nowadays this reward is given in 83 categories of 30 music genres as a result of voting by authorized members of the "Recording Academy". The most prestigious nomination for metal bands is the "Best Metal Performance", which for the last thirty years, many artists including Ozzy Osbourne, Rage Against The Machine, Black Sabbath, Slayer, Iron Maiden, AC/DC, Motorhead, Metallica and other heavy bands were honored with. This year "Best Metal Performance" caused so much controversy among metalheads seeing band Mastodon the winner, whose release "Once More 'Round The Sun" was called one of the best albums of the year by the most popular rock and metal editions (Loudwire, Rolling Stone, Revolver Magazine). The album also reached #1 position of the US Billboard magazine's "Top Rock Albums" and the British Official Charts Company's "Rock & Metal Albums". However, the award of "Recording Academy" has been criticized earlier. For example, Ultimate Classic Rock's journalist wrote the article "10 Times The Grammys Got It Wrong", in which he mentioned that bands and musicians such as The Doors, Jimi Hendrix, Led Zeppelin and The Who have never won a Grammy. We make a clarification that Led Zeppelin received a statuette for the "Celebration Day" in the category "Best Rock Album" in 2013. However, we can agree with the rest of the author's article: without exaggeration, a lot of the great bands were left without academics' "gramophone". "Grammy is an award, established by the American Academy of Recording, that is recording industry's flesh of the flesh and blood of the blod. Previously, the record industry really was the backbone of the entire musical life, but now, with Internet's development, that's not true. This award is only needed for the Record-industry, which is desperately trying to attract attention. But this is absolutely dying history, which has no connection to the actual music." not having tracks or albums with words such as "Satanic" or "Satanist". 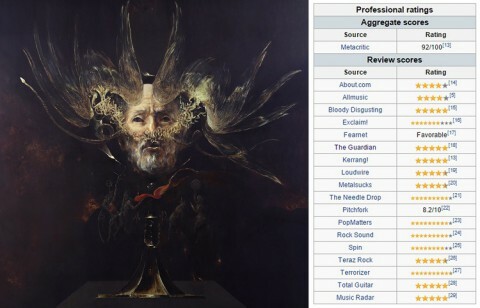 It is not hard to guess that "The Satanist" is one of the best releases of the year, but Behemoth were not even in the nomination for "Best Metal Performance". As well as Triptykon with the album "Melana Chasmata" and At the Gates with "At War with Reality". So should metalheads pay their attention to Grammy Award, if it so clearly depends on the amount of the major labels' profit? We don't think so.